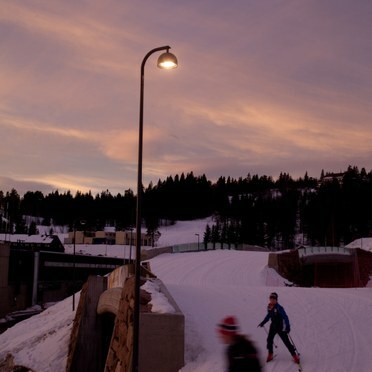 The new cross-country trails at Holmenkollen Ski Arena show how good lighting technology combines with modern and functional design to create a durable and energy efficient solution that blends effortlessly into the natural environment. The Holmenkollen ski jumping hill at Oslo, Norway, is widely regarded as one of the best-known sporting arenas in the world. Originally built in 1892, it has been renovated 19 times and was entirely rebuilt in 2010 for the 2011 FIS Nordic World Ski Championship. 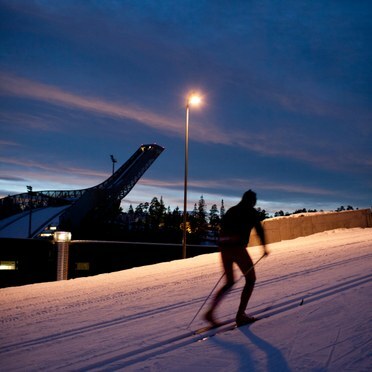 The Holmenkollen Ski Arena chose Thorn's Victor and Civic luminaires to light the new 6 km cross-country trails around the jump. Aside from the superb lighting quality, Holmenkollen selected Victor because of its timeless design and easy to install, easy to maintain benefits and Civic because of its durability and energy efficiency. Kenneth Nybakk and Hans Øien from Thorn carefully managed the planning and delivery of the scheme, which included 120 Victor luminaries (70W) and 70 Civic luminaries (70W), designed to meet the European standard EN 12193:2007 Sports Lighting. Bravida, Scandinavia's premier integrated supplier of technical installation and service solutions for buildings and plants, began installing Victor in the summer of 2009 and delivered the final luminaire in the autumn of 2010. The FIS Nordic World Ski Championship ran from 23 February to 6 March 2011.